Meriwether Lewis was born August 18, 1774 at the Lewis family estate, Locust Hill, in Albemarle County, VA. His family boasted many decorated soldiers, including his father, William Lewis. His mother, Lucy Meriwether was his father's cousin. She was also a skilled cook and herbalist whose generous and charismatic nature was known throughout the region. The Lewis and Meriwether families were among the first to settle in the region, and as such, had a long standing connection to and deep friendship with the Jeffersons, among other established Virginia families. Thomas Jefferson knew Meriwether Lewis for the latter's entire life. William Lewis died of pneumonia in 1779 after crossing a freezing river on leave from the military so he could visit his family. Shortly afterwards, Lucy Lewis married a retired officer, Captain John Marks, in May of 1780. John Marks moved the entire family to Broad River Valley, Georgia, settling in the new Goosepond Community created by General George Mathews. During his time in Georgia, Lewis enhanced his skills as a hunter and outdoorsman. He would often venture out in the middle of the night in the dead of winter with only his dogs to go hunting, at eight years of age. He became interested in natural history, which would develop into a lifelong passion. His mother taught him how to gather wild herbs for medicinal purposes. It was also in Broad River that Lewis first dealt with a native Indian group. The Cherokee Indians lived in antagonistic proximity to the white settlers, but Lewis seems to have been a champion for the Cherokee amongst his own people. Gov. George Gilmer of Georgia described young Meriwether as "having inherited the energy, courage, activity, and good understanding of his mother." The family grew while in Broad River when Lucy Marks gave birth to Lewis's half-brother and sister, John Hastings Marks in 1785 and Mary Garland Marks in 1788. Meriwether Lewis stayed in Georgia only a short time, he chose to return to Virginia sometime between the ages of 12 and 14 to manage Locust Hill and undergo a formal education. Lewis attended school taught by Parsons William Douglas and Matthew Maury. (Douglas also tutored future presidents Jefferson, Madison, and Monroe.) Following his studies with Maury, Lewis studied with Dr. Charles Everitt. However, he and Everitt developed some animosity towards each other, and he transferred to the Rev. James Waddell in 1790. Lewis finished his formal education with Waddell. He briefly considered attending the College of William and Mary, but opted to remain in Albemarle to maintain Locust Hill instead. During the early years of his management, Lewis increased the size of Locust Hill and carefully observed all of the flora and fauna that grew on his land. In 1792 John Marks died and Lewis's mother and half siblings returned to Virginia as well. In August 1794 in an effort to quell the Whiskey Rebellion President Washington mobilized 13,000 militiamen from Virginia, New Jersey, Pennsylvania, and Maryland. Lewis was among those that enlisted. Though the revolt was quickly suppressed, he decided to remain with a volunteer army under the command of General Daniel Morgan which patrolled Pittsburgh following the revolt. In August of 1795 Lewis joined the forces of General "Mad" Anthony Wayne at Fallen Timbers in time for the Treaty of Greenville, which accorded peace between the United States and several Indian tribes which had been attacking settlers in the western outreaches of the country. He served alongside another soldier with whom he would become well acquainted, William Clark. In late 1795 Lewis was reassigned to the Chosen Rifle Company, which was commanded by Clark. The two became friends and developed a deep respect for each other. Unfortunately, Clark was forced to resign his commission soon after Lewis's arrival due to familial and health related problems. On December 5, 1800 Meriwether Lewis was promoted to the rank of captain. In February of the following year he was invited by his longtime acquaintance and newly elected president Thomas Jefferson to become his private secretary and assistant. During his first few months in office, Jefferson developed his plan for studying the western outreaches of the American continent, and exploring new species of interest to botanists and naturalists. Jefferson discussed this idea with Lewis, and Lewis promptly volunteered to lead the proposed expedition. Jefferson sent Lewis to study natural history, botany, astronomy, and other disciplines with some of the leaders in each respective field at the time to prepare Lewis for the journey and give him a background on which to base the scientific observations which Jefferson desired the expedition to record. Jefferson proposed the expedition in a somewhat clandestine message to Congress in January, 1803, and it was approved. Jefferson left the task of recruiting men to accompany the exploration to Lewis and allowed him to invite William Clark to be his co-captain. Lewis wrote Clark, informing him of the expedition and invited him to become his partner. Due to the inefficiency of the post at the time, Clark's response was delayed. Lewis offered the position to another man, Moses Hooks, should Clark decline. A few days later, Clark's elated acceptance of the offer arrived - Lewis rescinded the offer to Hooks. The expedition began on May 14, 1804, and returned in the late summer of 1806. In 1807, Lewis returned to Washington for several events celebrating the success of the expedition, also recognizing Lewis's personal merit. He intended at that time to start organizing his journal and field notes for publication. He disseminated his celestial observations and plant and animal specimens that the party had brought back to various scientists for further examination, analysis, and preservation. President Jefferson appointed him Governor of Louisiana, a territory the United States had acquired shortly before the expedition departed in the Louisiana Purchase of 1803. In 1809, as Lewis traveled from New Orleans to Washington to see Jefferson and apprise him of his progress on publishing the journals, Lewis died. 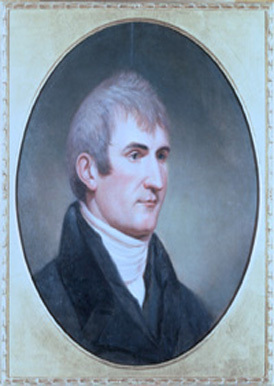 There is some controversy over whether the governor committed suicide, or whether he was murdered as part of some conspiracy, but either way, on 18 October 1809, Meriwether Lewis was found dead of several gunshot wounds in Grinder's Inn, in Natchez Trace, Tennesee. Abrams, Rochonne. "The Colonial Childhood of Meriwether Lewis." Bulletin of the Missouri Historical Society XXIV July 1978: p. 218-327. Dillon, Richard. Meriwether Lewis: A Biography. Coward-McCann, Inc. New York, New York: 1965. Hendrix, James. "Meriwether Lewis's Georgia Boyhood." We Proceeded On, August 2001: p. 25-28. Lewis, Mary Newton. "Meriwether Lewis: Devoted Son." We Proceeded On, May 1990: p. 14-20. Saindon, Bob. The Boy From Locust Hill. Special Printing. August 1986. Wilson, Charles Morrow. Meriwether Lewis of Lewis and Clark. Thomas Y. Crowell Company. New York, New York: 1934.